How do I sign my child up for football or cheer? Teams begin signing players up in the Spring and we are always looking for new players. On our website, if you look under the “Football” tab, you will find all of the age groups we offer in San Antonio, as well as, lots of information on our football and cheer programs. Also look under the “Teams” tab under the football tab to find a team close to your area. 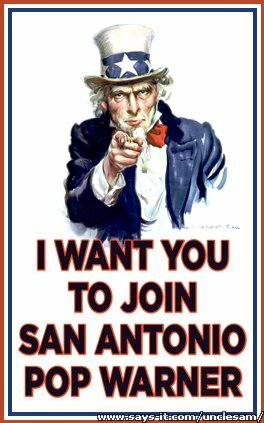 We currently have fifteen teams in San Antonio. With Pop Warner you register directly with the team.